One thing I’ve noticed about my appreciation of (mainstream) Comics as I get older is that the issue of continuity concerns me less and less. Fifteen or so years ago, it was a different story: it was incredibly important. I had high expectations of the stories I read connecting perfectly and not being riddled with contradictions – and those expectations were efficiently catered to via a massive effort from the big publishers to give the hugely-complex histories of their major properties an overall cohesion. Nowadays however, if I read a Batman comic, say, I’m pretty much satisfied so long as the core elements are present and correct, i.e: Bruce Wayne is Batman, Alfred and Commissioner Gordon are there, the Batcave, Batmobile, etc. While continuity serves a good purpose in keeping massive mythologies relatively neat and tidy – and the fans very happy – the considerable downside is that it ultimately places a massive handicap on the greatest ongoing challenge in Comics publishing: attracting new readers. Despite the best intentions of publishers, “jumping on points” for new readers are somewhat Quixotic, because to really get it, you still have to negotiate decades of continuity which, in the case of something like Marvel’s X-Men franchise, is utterly daunting even for the most eager newcomer. In an effort to combat this longtime conundrum, DC Comics have created a new imprint of original graphic novels entitled DC: Earth One.The hook is that the series will reintroduce DC characters to new readers, wholly unburdened by decades of continuity, in stories focused on their first years and earliest moments set in a new continuity on a new Earth. Suitably enough, DC start with their first and biggest superhero in an re-versioned origin story penned by J.M Straczynski (Babylon 5, Spider-Man) and drawn by Shane Davis (Superman/Batman: The Search For Kryptonite). 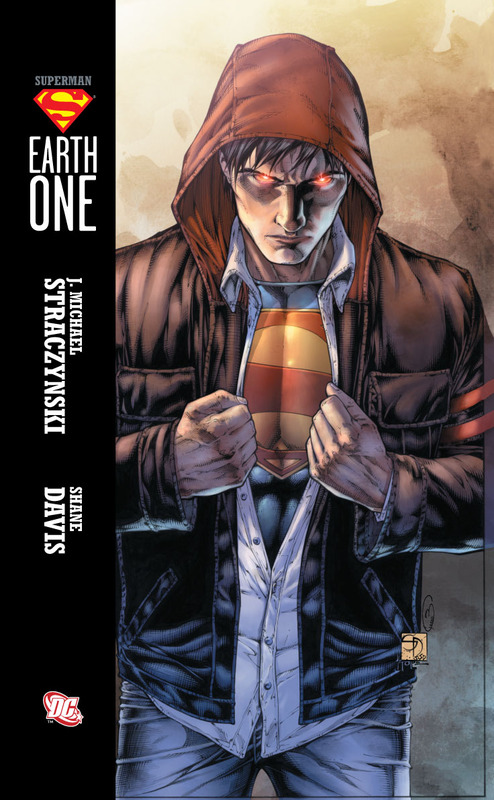 Were you to judge the inaugural Superman: Earth One, by its cover – depicting a young and rather intense-looking Clark Kent (a clear nod to the Twilight audience, one imagines) replete with an emo-ish hairstyle and clad in a hooded top, exposing the Superman chest emblem in an almost threatening manner – you might well fear the worst… as a long-time fan. As a new reader who probably knows Superman as an ultra-clean cut character, it’d certainly pique the old curiosity – and judging by the vast amount of mainstream news coverage this book recently received in the U.S, that goes for a lot of other people too. However, the truth is that this is not The Angry Adventures of Emo-Superman. Straczynski is a smart writer who clearly knows that – especially with Superman – there’s a very fine line between updates that keep the character fresh and interesting for new generations and changes that damage the magic. After all, there’s a reason that the character has endured very little change in his 72 years of existence. (You could argue, of course, that Straczynski is somewhat aided in his quest by the fact that, over the last decade, the soon-to-end Smallville TV series, surely with a wider audience than the comics, has placed a surfeit of pretty radical kinks in the established Superman mythology and it’s been just fine.) In Superman: Earth One,Straczynski does an admirable job of toeing that fine line while imbuing the character’s origin with more edge – though not gratuitously so – and, crucially, making it more humanistic and identifiable. As such, Straczynski’s Clark Kent is an aimless and quietly-frustrated 21-year old burdened with The Big Question: what do I do with my life? He’s been blessed with superhuman abilities, abilities that can easily bag him a hugely-paid job that will set him up for life and ensure his widowed mother is fully taken care of – or there’s the selfless option B: put on the flamboyant costume that his mother made and use those powers for the good of Mankind, meaning that he will instantly and permanently sacrifice any semblance of a normal life. It’s an effective bit of grounding on Straczynski’s part: who wouldn’t consider the selfish benefits of such fantastic powers? Yet, what makes it even better is that Martha Kent, in classical maternal fashion, is playing the long-game with quiet, knowing confidence: she knows what her boy will do, but it has to be his choice. And the edginess promised by the cover? Well, it’s not as pervasive as you might think, in fact just a one page sequence where Clark, confronted by a mugger in Metropolis, gives him a harsh top-up tan. We see further interesting kinks when Clark ultimately follows up his existing interest in Journalism and applies for a job at The Daily Planet, a once-great newspaper now struggling in the face of online news (both professional and amateur), headed by gruff old-school newsman Perry White. Surprisingly, Lois Lane is very much a peripheral character – she’s clearly being saved for the next volume – an impatient rookie reporter with self-confidence constantly hovering on arrogance and Jimmy Olsen is now either very close to or the same age as Clark, cheerful as ever, but here with the gung-ho bearing of a war photographer. There’s a hint of Peter Parker in the manner of how Clark finally gets a job at The Planet. Straczynski’s best reimagining, which fuels the action-packed third act where an alien armada lands on Earth forcing Clark to make his fateful choice about his future, [SPOILERS!] is that Krypton was not the victim of a natural cosmic disaster, but rather a planetary assassination, committed by a neighbouring (and comparatively under-resourced) planet in Krypton’s galaxy, aided by an unknown agency. The rival planet’s plan was to eradicate all of Krypton, so the loose end of one survivor means that Clark has been a marked man since the day he was born and his discovery of his alien heritage leads his pursuers straight to him, endangering all of Earth. It’s a great twist: will Superman’s benevolent mission possess a heavy of tint of vengeance now it’s clear that his parents and his homeworld were murdered…? A moment that I particularly liked comes via a flashback when Clark, surveying the suit, asks why there’s an “S” on the chest. Martha tells Clark that it was a source of disagreement between her and her late husband: she wanted it to stand for “SON” – of his alien home, of Earth and of her – while Jonathan ruled it out as “too vague, too fuzzy, too cute”. He says: “My cousin was in advertising and he said you should pick a symbol, to get across one clear idea. That’s all the public has patience for. You’re not just different from every other man, Clark, you’re more powerful than any other man in history. You’re unique to all the world. Extraordinary. Not just a man – and more than just a man. A super-man. “Superman”. I always liked the concept of the “S” symbol being a family crest (Superman: The Movie) or a wider cultural insignia (Superman: Birthright), but Straczynski’s cue, while lacking grandeur, certainly provides a nicely realistic touch – and it’s absolutely true: that “S” shield does convey the notion of benevolent power. Davis’ artwork, so engaging in his Superman/Batman arc, is excellent here, equally adept at conveying emotion it does large-scale action. 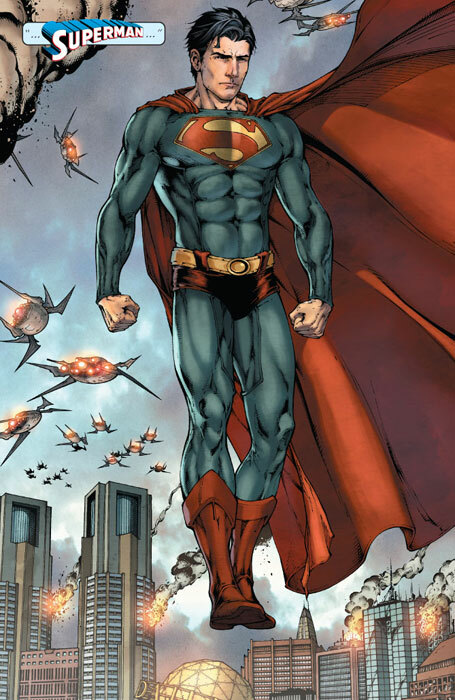 His subtle redesign of the Superman costume is great: nothing at all drastic, but I could quite easily see that on the big-screen and be absolutely fine with it. (And yes, Clark Kent’s refined disguise at the book’s climax is pointedly hipster-ish – fine.) 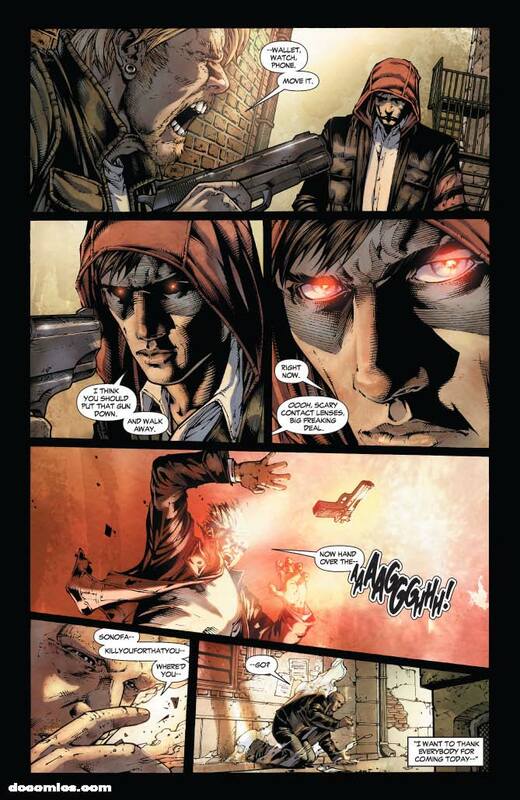 If there’s once particular criticism to make – and it’s made as a long-time Superman reader – it’s that Straczynski’s alien invasion conceit, while suitably epic and entirely effective, is all too similar to Mark Waid’s similarly origin-revamping Birthright and this may mark it as derivative in a fan’s eyes. However, for a new reader who wants some cinematic -sized action and carnage, it duly delivers. And that’s the point – Superman: Earth Onehas been a massive success in the U.S and DC are unsurprisingly rushing ahead with a sequel. 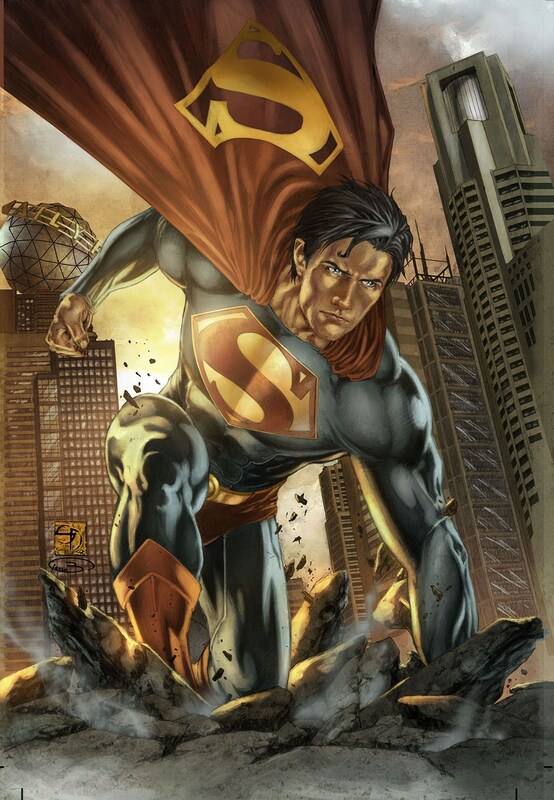 It’s easy to see why: Straczynski has done a great job in maintaining Superman’s essential grandeur and by giving equal focus to the “man”, he’s made the character a lot more accessible and comfortably placed him in a 21st century context. By the story’s end, you have a Superman for our world – and if this is how you make your debut visit to that world, you’ll be on board for the next adventure. Superman: Earth One is published by DC Comics and available now. It will be published in the UK on 28th January 2011 by Titan Books.